Fort Loramie coach Carla Siegel talks to a player during the first half of a Shelby County Athletic League game against Russia on Jan. 6, 2018 in Fort Loramie. Fort Loramie’s win over Houston on Monday earned Siegel her 400th career victory. 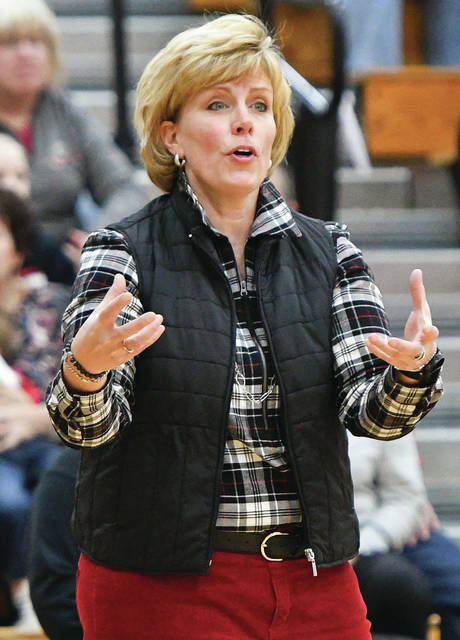 FORT LORAMIE — Fort Loramie crushed Houston 69-18 in a Shelby County Athletic League game on Monday to earn coach Carla Siegel her 400th career victory. Siegel, who is in her 20th season as the school, has a 400-116 career record. Fort Loramie jumped out to a 19-8 lead in the first quarter behind eight points from Marissa Meiring. The Redskins then outscored the Wildcats 17-2 in the second quarter to take a 36-10 halftime lead. Meiring led Fort Loramie with 17 points, nine rebounds and six steals. Macy Imwalle had 11 points and four rebounds and Dana Rose had 10 points and six rebounds. The Redskins shot 31 for 65 (47 percent) from the field. Hayden Riesenbeck and Amber Stangel each scored six points for the Wildcats. Houston shot 7 for 24 (29 percent) from the field. The Trojans cruised by Indian Lake in a nonconference game on Monday in Botkins. Grace Homan scored all nine of her points in the first quarter to help Botkins take a 24-0 lead. The Trojans increased their advantage to 33-4 at halftime and led 53-10 going into the fourth quarter. Jill Greve led the Trojans with 12 points while Sydney Meyer added 12. Nine total players scored for Botkins. Jackson Center built a 17-5 lead by the end of the first quarter and cruised to a nonconference win at New Knoxville on Monday. Aidan Reichert led the Tigers with 14 points while TJ Esser scored 12. Christopher Elchert added nine points and Trent Platfoot scored eight. Sam Anspach led New Knoxville with nine points.